There was great excitement for the children in sharing their learning with parents/carers during the open mornings this week. We hope that you were able to see how well your child is progressing. 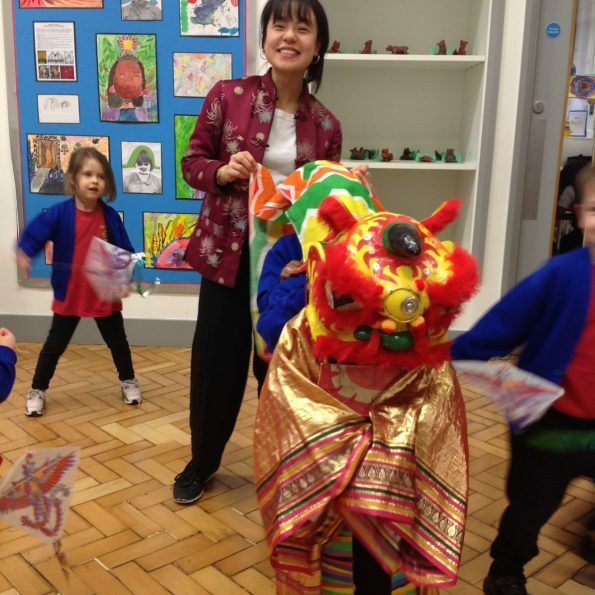 Reception class celebrated Chinese New Year this week and invited Miss Law to join them for the festivities. 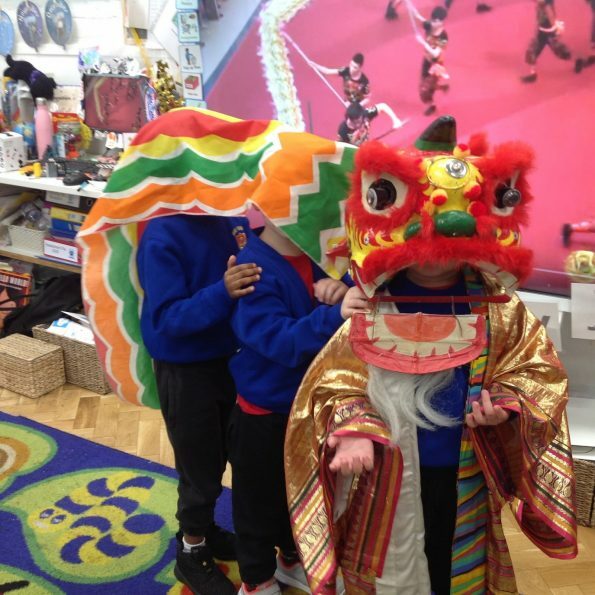 Children across the school also enjoyed their Chinese New Year themed lunch on Tuesday. 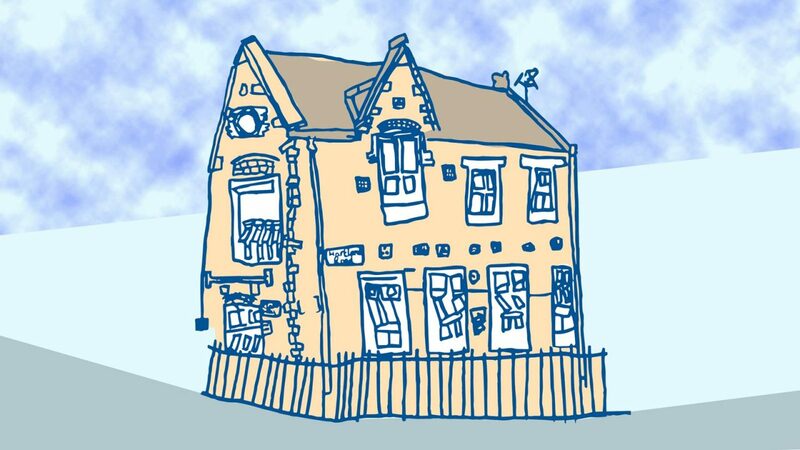 Parents Evening – 26th/27th Feb (Y5 not 26th but Thurs 28th Feb instead) SIGN UP SHEETS WILL BE IN THE CHURCH HALL ON MONDAY AND TUESDAY 11th/12th Feb at 8.30am and 3pm. Shakespeare Performances: Tues 26th March: KS1 at 10am & 2pm; Weds 27th March: Y5/Y6 at 7pm; Thurs 28th March: Y3/Y4 at 2pm and Y5/Y6 at 7pm. Football – We are very proud of our girls’ team, who finished third in the league and therefore progressed to the play-offs. Unfortunately they did not get through to the finals, but it was close! They lost 1-0 to Gospel Oak and 2-1 to Beckford, but finished on a high by beating Richard Cobden 2-0. A particular well done to Lucy, our captain, for leading the team so brilliantly this year and setting a superb example by always trying her hardest. Athletics – Earlier this week, children from Y3 and Y4 took part in an indoor Sports 4 All Athletics event organised by the Camden Schools Sports Association. They all took part in various sprint races, jumping events and finished off with a team relay race. The children performed to their best ability and it was great to see the huge smiles on all of their faces throughout the event. We are extremely proud of them all! International Book Giving Day’s focus is on encouraging people worldwide to share their love of books by giving a book to a child on the day of love, February 14th. We will update you at the beginning of next week about the organisation of the book swap next Thursday after school but please keep books coming in. Our minds can be our greatest ally or our greatest critic. It is therefore advisable to train your ally because when things become challenging, it could be your strongest tool. If your child is in Y4, Y5 or Y5 Camden Music are auditioning for singers to be part of an out of school project, in partnership with The Orchestra of the Age of Enlightenment. 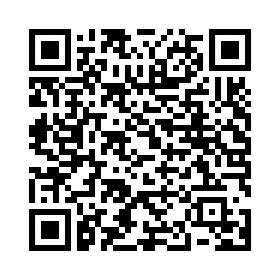 The audition dates are after school on: Tues 5th March, Thurs 7th & Fri 8th March. Please email, sheena.masson@camden.gov.uk to book an audition slot or for further information.